When we bought our house, the entire backyard was covered in concrete. It was so sad back there! One Thanksgiving, we ripped it all out and started the long and arduous process of planting every square foot. It took a really long time, a lot of plants died and I learned what might work best for our backyard. I decided that everything we planted though would need to have a purpose… either it should create shade where we needed shade, or it should produce something that we could eat. 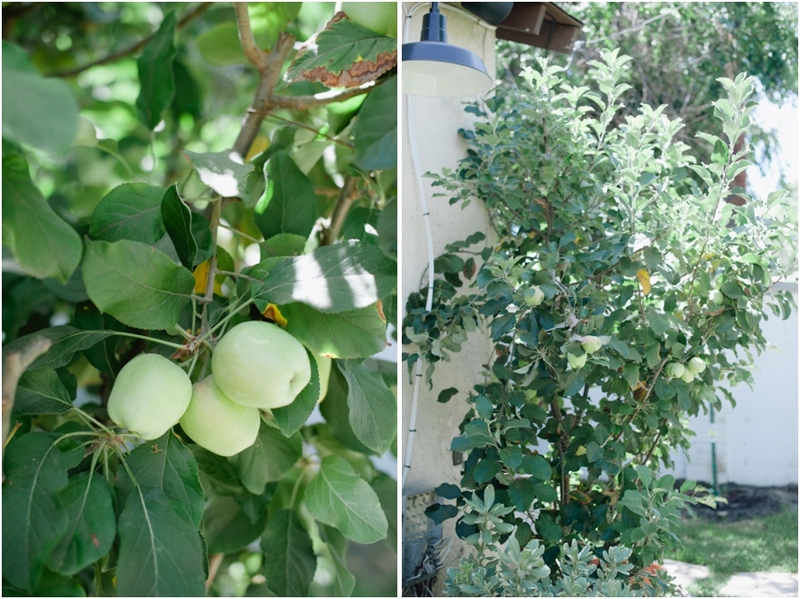 The apple tree was one of the very last additions to the yard, but I’m so happy I decided to plant it! I guess it’s been there for about three years now, and it has grown so well! A few times a year, my husband takes a chainsaw to it, under the guise of pruning. It looks absolutely ridiculous because Chris pays no attention to aesthetics. But, I guess it’s worked pretty well because it’s producing buckets and buckets of apples now. So, with all these apples (really, so many apples) I’ve got to do something with them. So far, pies & tarts. But, I figure that since I planted the tree, cared for the tree and harvested the apples, anything I cook with them is calorie free. Bring on the tarts! 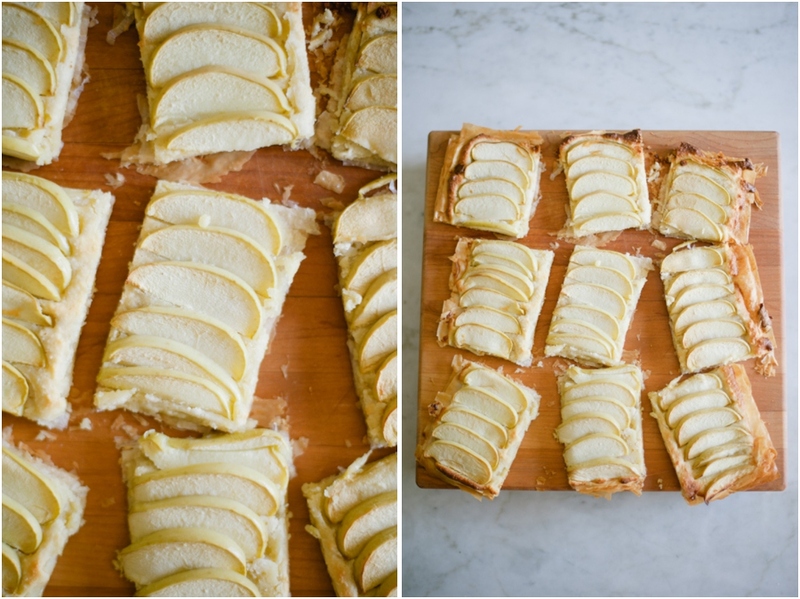 First up, Dorie Greenspans Crispy, Crackly Almond-Apple Tart. It’s simple, it’s delicious and an absolutely perfect way to end a meal! Enjoy! When you’re ready to construct and bake the tart, center a rack in the oven and preheat to 350 degrees F. Line a baking sheet with a silicone baking mat or parchment paper. Place one piece of filo dough on the lined baking sheet (keep the remaining pieces of filo covered with plastic wrap), brush it with melted butter, and sprinkle it with sugar. Cover with another sheet of dough, then butter and sugar the sheet. Continue until you’ve stacked, buttered and sugared all 8 sheets. Using a small offset spatula or the back of a spoon, very gently spread the almond cream over the top of the filo: you can leave a slim border of uncovered dough on all sides – it will curl in the oven and that’s rather nice – or you can spread the almond topping all the way to the edges. Work slowly and be gentle, since filo is extremely delicate – if it tears (and it probably will), patch it with almond cream. 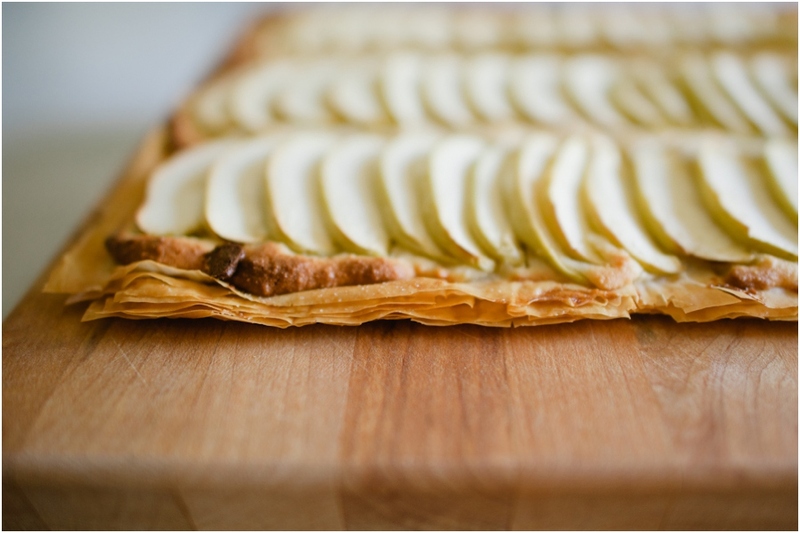 Cover the tart lightly with plastic wrap while you cut the apples. Slice each apple in half from top to bottom and remove the core. Cut each half lengthwise into very thin slices, keeping the slices together – you should get about 14 slices per half – then use the palm of your hand to flatten and fan them. 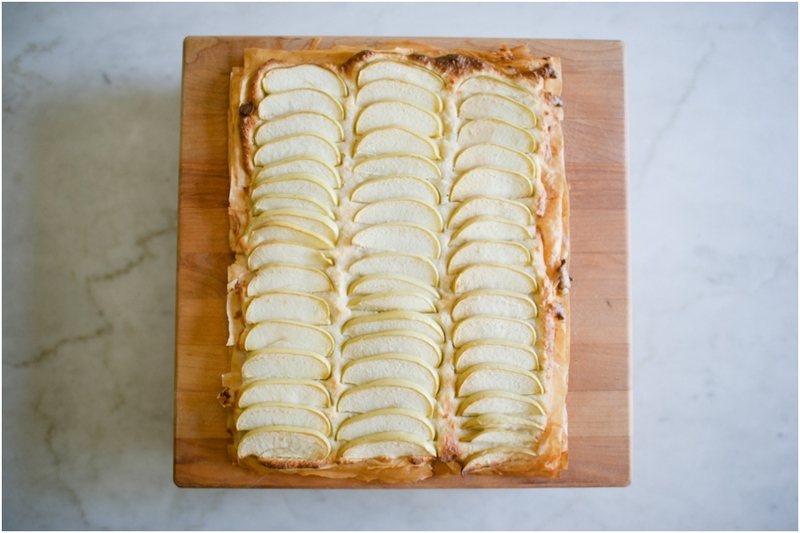 Arrange the fanned -out apples on top of the almond cream, placing them in 3 long rows down the length of the tart or in as many short crosswise rows as you can fit. Keep the rows fairly close together, but allow a little almond cream to peek out between them. 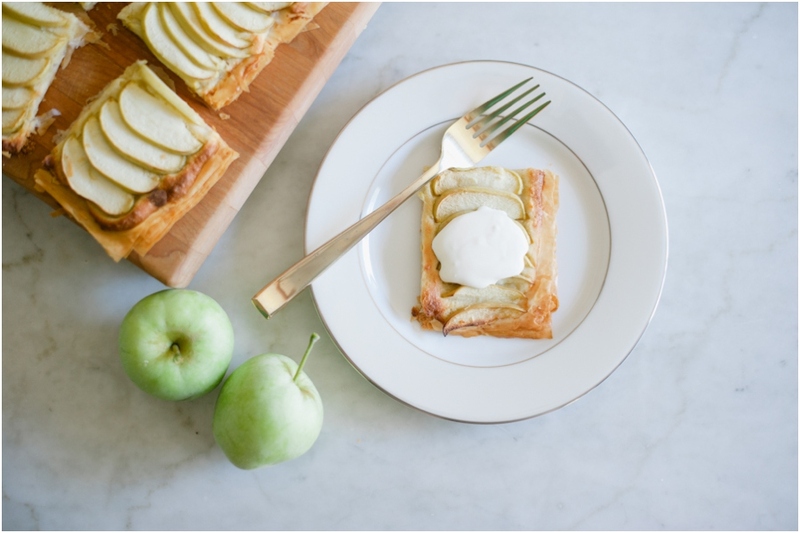 Bake the tart for 30 to 35 minutes, or until the apples are tender when pierced with the tip of a knife and the almond cream is set. 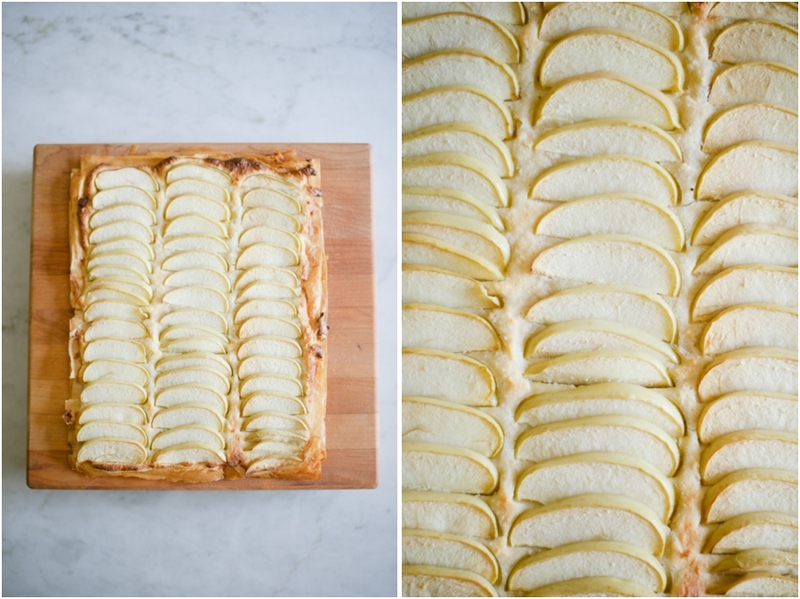 Transfer the baking sheet to a cooling rack. Stir the water into the apple jelly or apricot jam and bring it to a boil in a saucepan over medium heat or in a microwave oven. 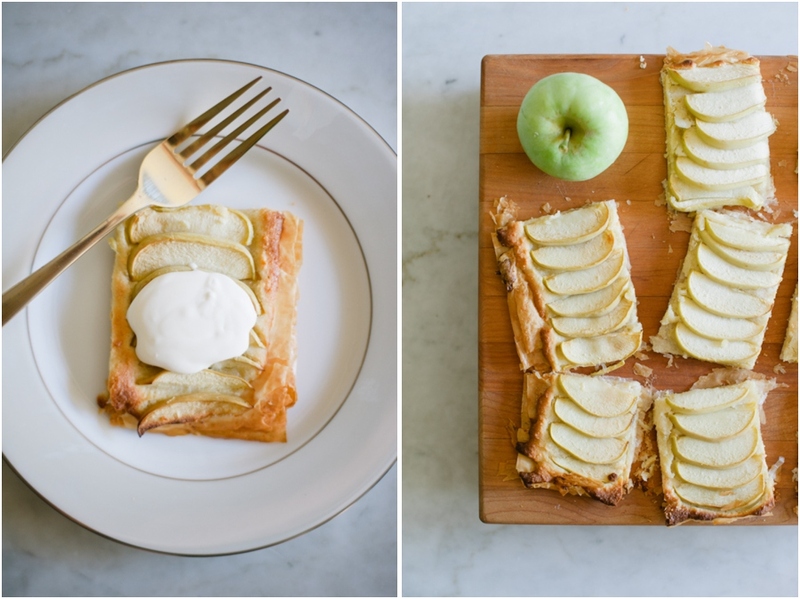 Gently brush the glaze over the entire tart. Using a cookie sheet or two large metal spatulas or pancake turners, transfer the tart to a serving platter or cutting board. Serve warm or at room temperature.